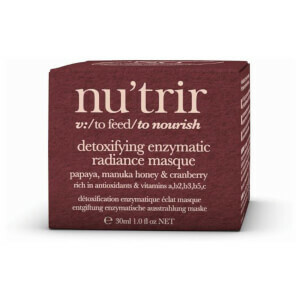 Australian made and 100% naturally derived, Nu'trir offer nourishing, natural products that produce real results. Containing nutrient rich vitamins and antioxidants to feed the skin and essential oils to nourish the skin. It's also about what's NOT included, which is: NO parabens, petroleum, SLS, mineral oils, sulphates, silicones, phthalates, PEG’s, petrochemicals, artificial colours or fragrances. Nu'trir does not test on animals, and contains no animal ingredients. Try Nu'trir today for a wonderful natural alternative to traditional skincare. SHOP: Nourishing Cleansing Oil - a botanical and antioxidant rich oil based cleanser to remove makeup, impurities and dead skin cells leaving your skin feeling hydrated and nourished. OR Collagen Boosting Peptide Serum - containing nutritional oils and antioxidants to relieve dry skin, regenerate, repair and protect the skin, whilst peptides stimulate collagen production, for younger looking, soft and hydrated skin.